Spencers Solicitors | How can we make horse riding safer on our roads? What has Health and Safety ever done for us? How can we make horse riding safer on our roads? We are known as a nation of animal lovers, but that doesn't always seem to be reflected in the level of care taken when motorists encounter horses and riders on the road. It's estimated that there were more than four thousand horse related accidents in 2012, but the British Horse Society believes that traffic accidents involving horses, many on side roads and country lanes, are significantly under reported. Recently, a rider in Dorset had a 'miracle escape' after her horse was knocked by the side of a van as it passed on a country road. Both horse and rider were actually tipped onto the flat-bed trailer the van was towing, suffering significant injuries in the process. Yet, on this country road, there were actually multiple passing places the driver could have easily stopped in for a few moments, let horse and rider pass safely, and avoided such an accident. "For the last three weeks we have received verbal abuse from cars on the road and people can be so inconsiderate. Sometimes they come right up to the back of the horse and they don't realise that if the horse gets spooked then it could cause a bad accident and possibly injure them as well as myself"
Often I see these incidents occur simply through a lack of understanding by motorists, and indeed pedestrians, of how easily a horse can be spooked by what may appear to be mundane events. Things like low flying aircraft, noise from bird scarers in nearby fields, or a sudden dog barking can scare a horse and put the rider in danger of serious injury - so imagine what a car horn, revving engines, or unsupervised animals can do. There are always two sides to every story, so it's important that both motorists and riders appreciate how best to behave on roads and when horses meet traffic. • Especially in the countryside, motorists should slow down and be ready to stop safely when approaching a horse, and take special care when approaching blind bends. • Avoid making noise through using your horn, loud stereo music or revving your engine. When you do pass, give as wide a berth as is safe to do so and overtake slowly without acceleration until you are well clear of both horse and rider. • Watch for any signals from the rider, as they may be able to inform you of any upcoming hazards. Likewise they may indicate a horse has been frightened or made anxious and for you to hold off your approach. 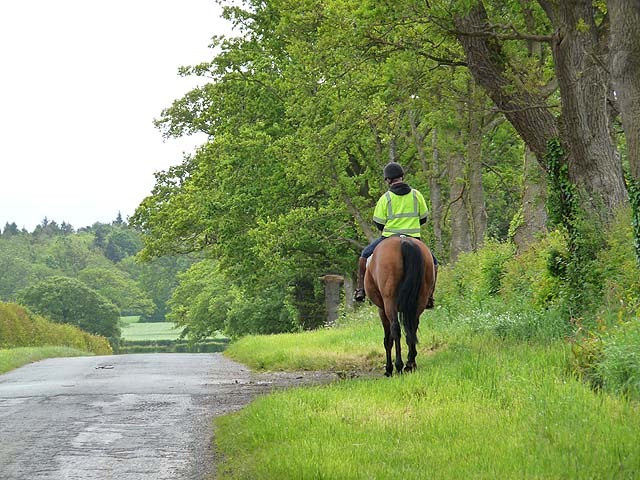 • Along with a suitable helmet and horse riding safety equipment, riders should always use reflective and high visibility clothing for themselves and their horse, especially in any poor light or weather conditions. In fact it's best to avoid failing light, fog, icy conditions and peak commuter time if at all possible. • Plan your route in advance and double check before your leave that there are no roadworks or hazards. You can do this by using highways websites like www.trafficengland.com or www.traffic-wales.com, and also check for potential horse riding related hazards along the route using www.horseaccidents.org.uk. • If certain roads are unfamiliar, it pays to ask an experienced rider to accompany you. When riding two abreast, move into single file as soon as possible to allow other road users to safely overtake. • It's also best to always take your mobile phone, and be sure to leave details of where you are going before you head out on your ride. Musician Mike Oldfield once said: "In summer, winter, rain or sun, it's good to be on horseback" and it's easy to understand the sentiment. Riding was an activity long before today's hustle and high speed society, and with sensible attitudes and careful behaviour, it can continue to be the safe pleasure it always has been. Personally, whenever I encounter a rider when driving, I like to keep in mind that four legs was a mode of transport long before four wheels, and to give them the respect they deserve! What are your top safety tips for when horse rider meets motorist? Please share them in the comments.